Killbros SeedVeyor Bulk Box Carrier for Enhanced Planting Efficiency - Unverferth Mfg. Unverferth Manufacturing Company, Inc. announces the introduction of the Killbros SeedVeyor™ Model 102 bulk box carrier. The two-box bulk seed carrier combines high-speed seed delivery direct to the planter or drill in the field with operator-friendly control for unmatched seed-planting efficiency. Equipped with the choice of an unloading conveyor or auger, the SeedVeyor model 102 bulk box carrier features a capacity of approximately 100 seed units. 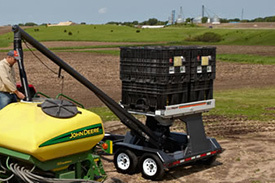 It is equipped with an easy-opening 5” x 6” door with a rubber funnel that regulates seed flow into the conveyor or auger. A standard on/off wired switch with a magnetic mount provides optimum user convenience. The easy-open unloading chutes feed the hopper for greater unloading efficiency. Protective lids cover the unloading chutes when not in use to keep out moisture and debris and feature convenient on-board storage when hauling seed. The conveyor’s eight-inch cupped and cleated belt inside the six-inch diameter steel tube gently carries seed at speeds up to 12 bushels per minute. Brush and patented side seals on the conveyor inlet minimize seed damage by preventing back-feeding. The poly-cupped auger flighting gently carries seed at speeds up to 10 bushels per minute. The SeedVeyor tender features an 18-foot long steel unloading tube with a 4-6-foot telescoping downspout that can reach up to 30 feet for filling up to 24-row planters. There’s also a hinged bottom door for convenient and complete cleanout. The model 102 undercarriage features rubber-cushioned suspension, tandem axles with electric brakes, highway-rated tires, LED lights and reflectors for transport safety. A two-part urethane enamel finish and silicone-sealed seams ensure a long-lasting finish on the body. The undercarriage, unloading tube and other parts are powder-coated to resist corrosion. See your nearest Killbros equipment dealer today for complete details on the SeedVeyor model 102 bulk box carrier and the SeedVeyor models 260 and 360 seed tenders, visit the Killbros website at www.killbrosequip.com.